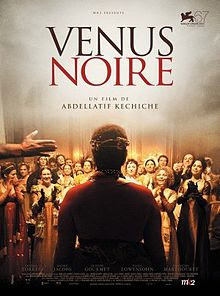 Black Venus (Vénus noire) in its naked truth is a painfully disturbing portrayal of the human condition. It is also a powerful declaration of human rights. The movie is based on the life of Sarah Baartman (also Bartmann). It was directed by Abdellatif Kechich (b. 1960 Tunis) and written by him with Ghalya Laroix. It is not only what approaches a historical documentary but also very contemporary as it contains elements so sadly familiar to many modern immigrants, strangers, aliens and other foreigners who are different in today's Europe, post-colonial England and France included. 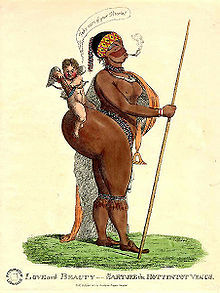 Wikipedia tells: "Sarah "Saartjie" Baartman (before 1790 – 29 December 1815) was the earliest and most famous of at least two Khoikhoi women exhibited as freak show attractions in 19th-century Europe under the name “The Hottentot Venus”. Baartman's physique, characterised by large breasts and steatopygous buttocks, though common among the Khoikhoi was rare in Europe. There it aroused widespread public fascination and fed curiosity about the sexuality of non-European races. Sarah Baartman experienced the "interest" of white Europeans in early 19th century England and France. She was an orphan taken with the dream of "from rag to riches" from her native South Africa to London by her master, Dutch farmer Caezar. 1814 she is taken to Paris where her "career" degenerated from freak shows to French saloons and finally to alcohol and prostitution. At only 29 years Sarah became fatally ill and died abandoned alone. Her body was dissected by curious scientists and her remains were later displayed to the public in Muséum d'histoire naturelle, Paris. The camera work focuses intensively on the face of Sarah who is acted with such great dignity by Yahima Torres. The effect of following with such intensity her facial expressions - or lack of them - leads to a complete reversal of the concepts "primitive" and "civilized" in the minds of the viewers. 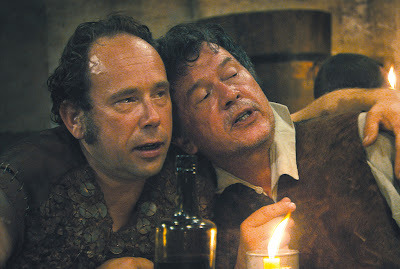 This powerful movie contains cruel naked debauchery and hypocritical attitudes of those judging others. All is exposed by director Adbellatif Kechich's cinematic skills in a truly painful manner - painful, because so truthful. We in the audience take part in the voyeurism and violation of her humanity by watching the movie - we know it but cannot stop looking and our basic instincts demand the right to do what we want to do regardless of the prise ... to others, that is. Sarah's earthly remains have been reburied in Vergaderingskop, Hankey, Eastern Cape, South Africa. 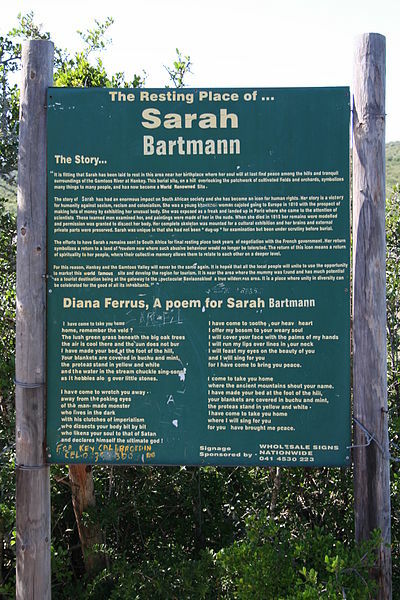 The signboard showing the location of the tomb includes a poem dedicated to her by Diana Ferrus. as it hobbles along over little stones. and declares himself the ultimate god! for I have come to bring you peace. where the ancient mountains shout your name. where I will sing for you. Black Venus is modern commentary to the words in the Letter to the Ephesians - who were not Sunday school children, either. These are not empty words - they are part of a divine message that eventually changed South Africa. This happened when the words reached also the oppressed and not only those in power. Ask, for example, Bishop Desmund Tutu or the Namibians. Therefore do not be foolish, but understand what the Lord’s will is. Do not get drunk on wine, which leads to debauchery. Instead, be filled with the Spirit, speaking to one another with psalms, hymns, and songs from the Spirit. Sing and make music from your heart to the Lord, always giving thanks to God the Father for everything, in the name of our Lord Jesus Christ. Cuvier, Georges, (1817). Mémoires du Muséum d'histoire naturelle: Extrait d'observations faites sur le cadavre d'une femme connue á Paris et á Londres sous le nomme de Vénus Hottentotte. Muséum d'histoire naturelle. Holmes, Rachel, (2006). The Hottentot Venus. Bloomsbury, Random House. Koster, Marian and Lisa Leimar Price, (2008). Rwandan female genital modification: Elongation of the Labia minora and the use of botanical species. In: Culture, Health and Society, 10(2): 191-204. Perez, Guillermo Martinez and Harriet Namulondo, (2011). Elongation of Labia minora in Uganda: including Baganda men in a risk reduction education programme In: Culture, Health and Society, 13(1): 45-57. Praise, Clifton and Scully, Pamela, (2009). Sara Baartman and the Hottentot Venus: a ghost story and a biography. Princeton University Press. Qureshi, Sadiah, (2011). Peoples on Parade: Exhibitions, Empire and Anthropology in Nineteenth-Century Britain. University of Chicago Press. 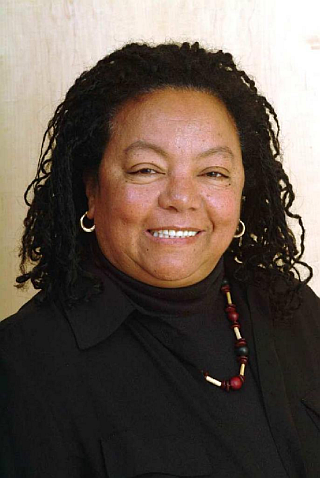 Sharpley-Whiting, T. Denean, (1999). Black Venus; Sexualized savages, Primal Fears and Primitive Narratives in French. Durham: Duke University Press. For us a child is born!